In addition to being more flexible, the new calendar layout provides the events in the hCalendar microformat. 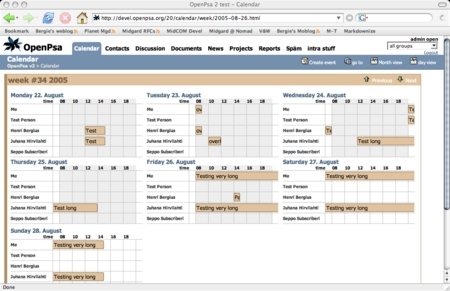 The vertical layout of org.openpsa.calendarwidget will be modernized into similar state and made into a configuration option useful for small organizations. Alan’s XUL calendar interfaces could also be useful although OpenPsa already integrates with desktop calendars and mobile phones. Besides regular group calendar usage, OpenPsa Calendar is being used for things like airplane reservations and work shift planning of medical staff.